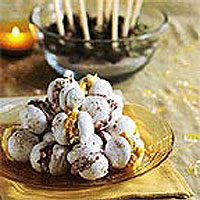 Serve each guest with 2 mini meringues - one with each type of cream. Preheat the oven to 110ºC, gas mark 1⁄4. Line 2 baking sheets with baking parchment. In a grease-free bowl, whisk the egg whites with salt until they are stiff and form firm peaks. Whisk in 2 tbsp sugar, then fold in the remaining sugar and half the cinnamon until thoroughly combined. Using a teaspoon, drop 24 small spoonfuls of the mixture onto each baking sheet, leaving space between each meringue. Flatten slightly and make an indent in each with the back of the spoon. Sprinkle with the remaining cinnamon. Bake for 2 hours or until the meringues are dry and can be lifted off the paper easily. Place the orange juice in a small pan, add the sugar and heat gently until the sugar dissolves. Add the cranberries. Bring to the boil, reduce the heat and simmer gently for 10-15 minutes until the fruit is tender. Lift out the fruit using a slotted spoon and place in a bowl. Turn up the heat a little and simmer the juice for 2-3 minutes, or until thickened. Pour the juice over the cranberries. Allow to cool. Gently fold half the Cointreau cream into the cranberries, but don't overmix it - the marbled effect looks pretty. Purée the mango and mix into the remaining cream. Just before serving, sandwich 6 pairs of meringues together with a generous tablespoon of mango cream, and the remaining 6 pairs with cranberry cream. The meringues can be made a couple of days in advance and stored in an airtight container. Do not fill them too far ahead of eating, as they lose their crispness quite quickly.